Marissa Nadler's music has always been dark, with an ominous tone. However, the Boston singer takes it to an entirely new level on her forthcoming sixth album, July (out February 4th). The lyrics are anger. It's not that boisterous, hollow-threat stab-you-in-the-neck-with-a-dull-pencil anger that you get from metal or punk bands. No, what Nadler gives you is that calm, collected angry, which is far far more frightening. The quietly menacing "Anyone Else" is the most obvious incarnation of this. The title of the record evokes thoughts of sweltering summer heat and hiding underneath SPF 100. The reality is the exact opposite. This is a harsh, desolate, and starkly depressing album. The opener "Drive" makes you envision our current dead of winter. It's the release you must feel when you finally accept that you're about to succumb to exposure and that your body will soon be lost to the snow drifts...at least until the spring thaw. The wafting "Was It A Dream" swings wildly between a dream and a nightmare. "Dead City Emily" is a beautiful Gothic number. The lone spot of relieve is "Holiday In", at least on the surface. Even here the brighter arrangement is juxtaposed with some deeply sullen lyrics. 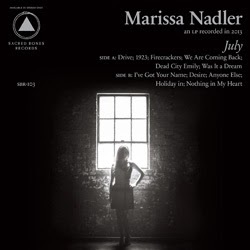 The downside to July, much like many Nadler albums, is that the songs all begin to sound the same after a while. In fact, the similarities may even be more pronounced this time around. That makes it a harsh listen. Best tracks: "Dead City Emily", "Holiday In"